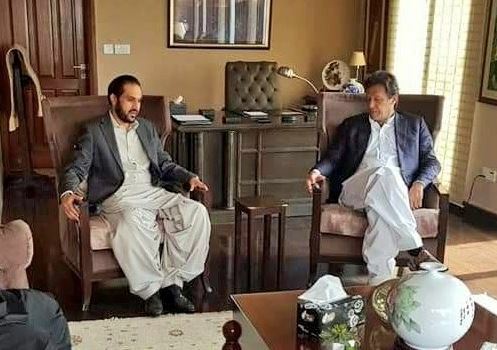 ISLAMABAD: Balochistan Chief Minister Abdul Quddus Bizenjo on Sunday called on Pakistan Tehreek-e-Insaf (PTI) Chairman Imran Khan, and decided to name Sadiq Sanjrani as the joint candidate for the position of Senate chairman. With political jockeying at its peak ahead of the election of the top Senate positions on Monday, independent lawmakers from Balochistan met the PTI chief at his Bani Gala residence. Media sources told that Bizenjo and Imran finalised the names of candidates for both positions, while the PTI chief maintained that the Senate chairman and deputy chairman should be from Balochistan and the Federally Administered Tribal Areas (FATA) respectively, to end the prevailing sense of deprivation. The Balochistan CM thanked Imran for his support and added that the PTI chief should also ask other parties to support senators from the regions suffering from isolation, sources added. The independent Balochistan senator-elect has been reported as the top contender for the Senate chairmanship in view of the support from PTI, PPP, MQM-P and Baloch senators. The media reports claimed Sanjrani is also backed by the PPP in exchange for his support for the proposed name for Senate chairman post. Imran agreed to back PPP’s candidate for the position of Senate deputy chairman after the Bani Gala meeting with Bizenjo. He announced his party’s support for any candidate named by the PPP. During the media talk in Faisalabad on Sunday, Imran said he had been asked to support the panel of Balochistan CM, which included a deputy chairman nominated by the PPP. According to media sources, PPP’s Saleem Mandviwala is the probable contender for the post. Meanwhile, Paktunkhua Milli Awami party Leader Mehmood Khan Achakzai has proposed names of Mushahid Ullah and Pervez Rasheed of the Pakistan Muslim League-Nawaz (PML-N) for the slot of Senate chairman and deputy chairman. The PkMAP assured PML-N Leader Nawaz Sharif of his complete support for the PML-N candidate for the Senate chairman and deputy chairman. Nawaz Sharif assured Achakzai of consulting with his party leaders over the nominations made by the PkMAP leader. Meanwhile, separate consultation meetings among the top-tier of PPP and PML-N were held on Sunday. While the PML-N is expected to roll out its candidates for both positions today, the PPP is confident that their leader will stand out in selecting the leader of the upper house of parliament. If the PPP doesn’t propose the name of Raza Rabbani, the PML-N will bring forth its own candidate, sources told. Earlier, Nawaz had proposed that the party would support Rabbani’s re-election as Senate chairman but Zardari dismissed the move. It was being reported that Salim Mandviwala will be the PPP’s contender for the chairmanship while the deputy chairman could be from one of the allies. Buoyant Zardari had affirmed the fact, saying Inshallah, and adding that his party has enough strength to get him elected. Elections for the seats of the chairman and deputy chairman will be held on March 12, when the senators-elect will also take their oaths.